The Standardbred horse has a trainable nature and is quite naturally competitive, which makes it well-suited to trotting races. The American Standardbred is to harness racing what the English Thoroughbred is to flat racing and steeplechasing. Standardbreds race either at the pace (a lateral gait) or the trot (a diagonal pace). The Standardbred is one of the fastest trotting breeds in the world. Up until the last couple of decades of the nineteenth century, trotters were more popular than the marginally faster pacers, but this is not so today. 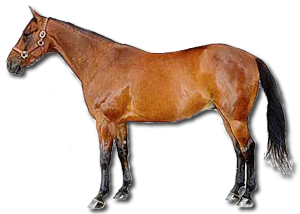 The standard bred is a powerfully built horse of rather less quality and refinement than the Thoroughbred and somewhat longer in the body and shorter in the leg. The shoulders are long and sloping and the croup invariably high. The head is refined and set on a medium-sized neck. The quarters are muscular but sleek. Clean hind legs are set well back. Character: generally of good disposition. One of the greatest Standardbred trotters of all time and the horse who did much to revive waning interest in harness racing in the 1930s was the flying grey, Greyhound, who in 1938 trotted the mile in 1:55.25, a record that stood for 31 years. The mobile starting gate, introduced in 1946 eliminated time wasting starts and together with greatly improved racing surfaces contributed to the recording of increasingly faster times by both trotters and pacers.